Here’s my thesis: The Golden Rule can be confusing & unhelpful in the Family Business. Okay, now that we are on the same page, imagine a mother who is lactose intolerant. Now, imagine her using The Golden Rule to determine what she feeds her infant. Out of love and by using the most beloved “rule of thumb” for determining the most moral course of action, she may end up severely under-nourishing her infant. The results could be devastating. So what went wrong? Can we blame her intentions? No. She wanted nothing more than to love that baby. Her intentions were noble. What was wrong was that she missed a crucial piece of information: what her body needs and wants is drastically different from what her baby’s body needs and wants. I use that analogy because it is so clear and concrete, but the same dynamic happens in family business all the time. I have no idea where this came from (though maybe a quick Google search would help me out! ), but it has been so helpful in our firm and with our families. What is the Platinum Rule? It keeps us from making assumptions. It encourages us to listen. If we are going to do unto others as they have told us they want to be treated, we must first listen to what they are telling us. And a lot of times, even if they don’t come right out and say it, they speak volumes with their bodies, eyes, and other silent signals. If we practice the Platinum Rule, it asks us to get outside ourselves and listen to others. It’s also a humbling reminder that we aren’t always as smart as we think we are. When we are searching for the common ground, when we are looking to establish meaningful connections, when working to resolve disagreements, what they want matters just as much as what I want. And unless we listen to each other about what we want, we’ll end up just being ships passing in the night, yelling at each other how well we are practicing the Golden Rule. The more families I work with, the more important I believe it is that people approach their family with curiosity instead of with assumptions (oh, he’s always been like that), and with listening instead of with asserting. 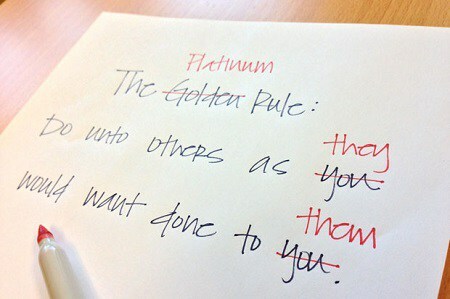 And this practice of switching the Golden Rule for the Platinum Rule can be a great tool toward that end. I invite your comments to jared@dvfbc.com.